Will the bees put honey directly in glass jars? 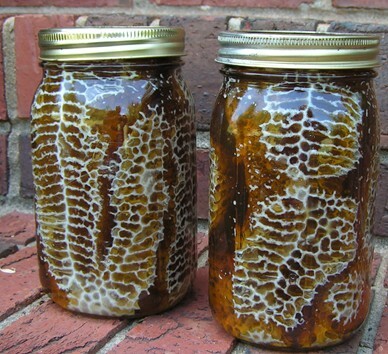 Having read about the technique of “growing” honeycomb in glass jars, we are trying to do it in 2008. 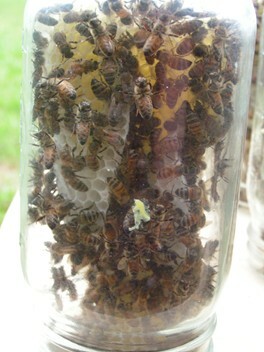 The bees do not like to work in small spaces like the jars, so they seem to be doing everything they can to avoid them. Fortunately, there has been a good crop of nectar in the neighborhood, so they are building comb in the jars. even though we had used a piece of beekeeping paraphernalia known as a “bee escape” for several days, and therefore, had to use more smoke that usual. We have just completed filling all of the empty spaces in the jars with our liquid honey. I suppose we could consider this experiment a success, since the jars are all filled with honeycomb. 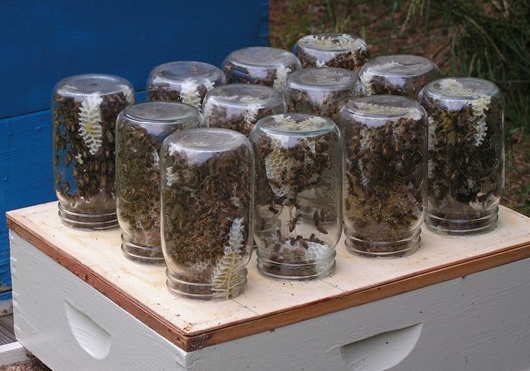 As a crop, it would be considered a failure, since in the time these jars had comb built in them, the same colony of bees would have made much more liquid honey for us.